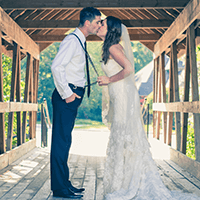 Chicago has a lot to offer, and it's one of the best locations in the state of Illinois to host a fantastic wedding ceremony. After all, Chicago has it all, a fantastic view of the baby blue Lake Michigan, a bustling downtown area filled with activity, as well as talented small businesses to help you pull off the weddings of your dreams. With all of the amazing photographers, dress boutiques, caterers, videographers, cake makers, wedding planners, and other wedding industry leaders who do business in Chicago, you're sure to have a ceremony that echoes the one you've been dreaming about since you were a little child. If you're still wondering how you'll get to and fro on your wedding day in Chicago, we've got the perfect option for you. Many couples choose to rent a limousines for their wedding day activities, but did you know that there's a better mode of wedding day transportation? Booking one of our gorgeous limos or buses for your wedding ceremony is sure to add an air of luxury, style, and convenience that makes everything go as smoothly as possible. You'll be creating memories before you even hit the altar, and let's face it, a party bus is much more stylish than any other choice of transportation! A Chicago party bus makes the absolute best option for these special events for many reasons. When you make the choice to book luxury transportation for your wedding, you're handing all of the troubles over to us, and we're happy to deal with them. So don't worry about a thing, because we make sure you get to your venue on time with our professional chauffeurs, and everybody is sure to fit in our spacious vehicles. Our party buses in Chicago have more room as well as more features than the competing mode of transportation, making your wedding an easy and breezy day filled with positive memories! Our Chicago party buses are known to have the best features in the area. We've taken great care to equip our vehicles with the best in deluxe amenities, so you'll always have an experience on the road that you'll remember. Our party buses in Chicago feature dancing poles, polished wood floors, USB ports for your iPod, sound systems with subwoofers, color changing lighting, large televisions with DVD players, ice filled bar areas with coolers, tinted windows, as well as comfortable leather seating for you and your wedding party. The wide array of luxury features offered on each of our vehicles is why our Chicago limos and buses rank in the top choices time and time again! It's easy as ever to rent your wedding day transportation in Chicago when it comes to Chicago Party Bus. Our team is working around the clock to bring you the best in premiere transportation in our luxury vehicles. You'll want to trust a company who has experience with weddings, and we've been servicing them since our inception. Let us take the worries out of your special day and turn it into the fairy tale that you so deserve! Call Chicago Party Bus to begin your reservation, and we'll be more than happy to answer any questions you might have! Want to read more? Try reading about planning a wedding in Chicago.